Only one thing's guaranteed to be better than bacon: double bacon! 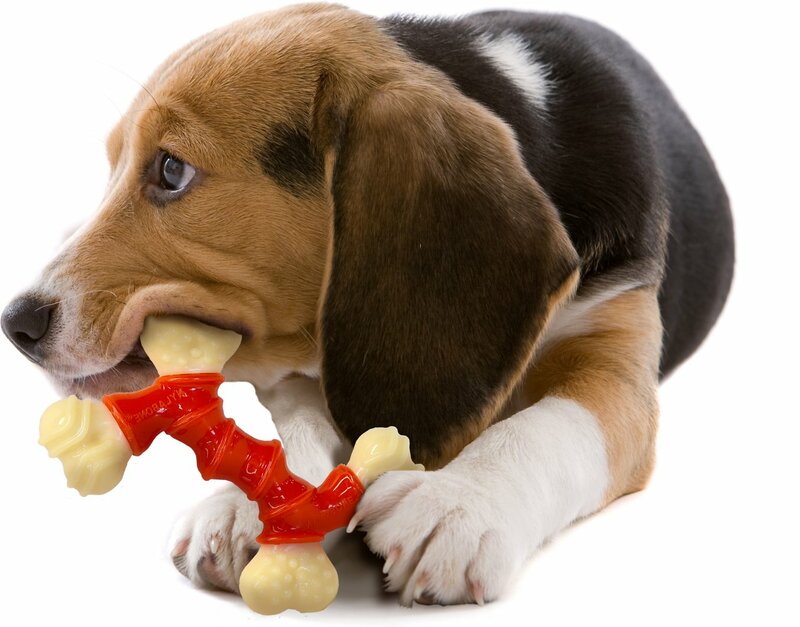 The Nylabone DuraChew Double Bone Bacon Flavored Dog Toy has twice the bacon-y flavor your best pal loves. 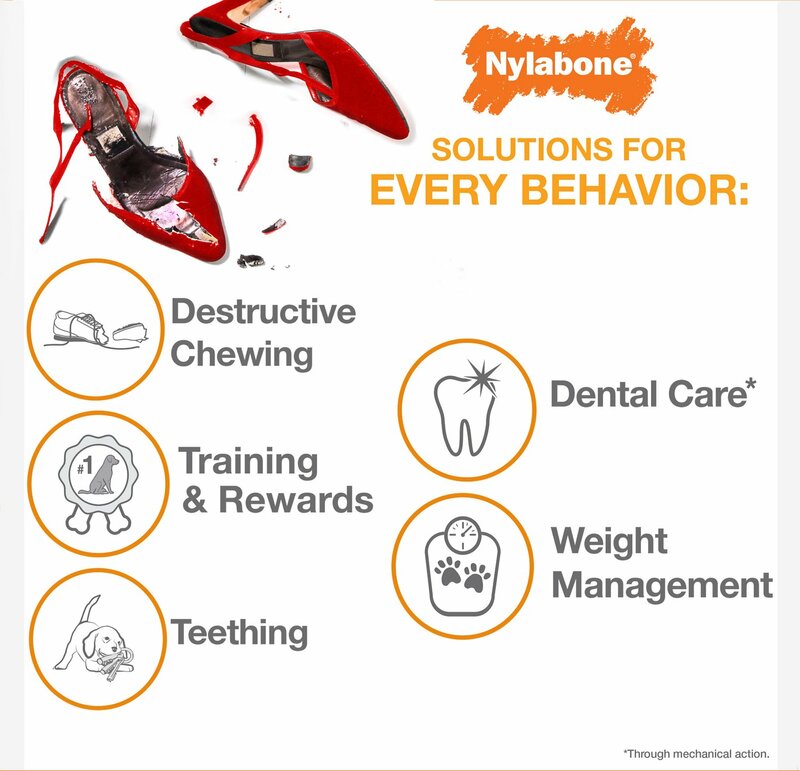 This doggie chew features durable nylon construction that even the most aggressive chewer will have a tough time destroying, and is designed to remove tartar and plaque, help freshen breath, and safeguard your household items from the teeth of your four-footed chewing machine. Durable and rugged nylon construction for lasting use so you can help keep your pet entertained and satisfy their natural instinct to chew. This fun bacon flavored chew encourages safe, healthy chewing habits so you can save shoes and furniture from destructive chewing. Action cleaning nubs and ridges help clean teeth and reduce tartar and plaque while your pet chews and gnaws. 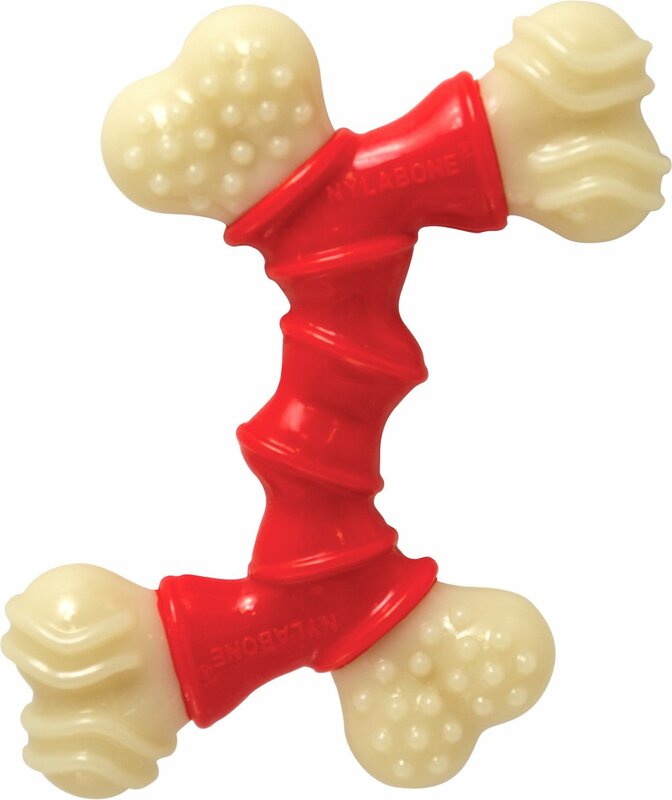 Unique design allows for easy chewing on any side and offers 4 bone tips so that it's easy to grab and hold. Vet-recommended so you can feel confident about giving this toy to your furry family member. I have a red boned coonhound who will sit on the floor chewing until a dog toy is broken, and EVERY time she has it completely destroyed in about 2-10 minutes. This toy has held up considerably. She chewed for about 15 minutes straight, got up, did a few other things, and went right back to chewing for another 15 minutes. The white tips are intact still and no big chunks are taken out. Its scratched up in a few places from her razor sharp teeth but nothing is broken. Im Impressed, Utterly surprised, and excited to have found such a fun thing for her. Our Golden/Shepard mix has extremely strong teeth and can destroy almost any toy! This is great for chewing, and she really loves it-but-after only two weeks, it is almost ready for the trash, little bits all over the floor. This is a really good choice for a dog who is not a 'destroyer '!!! I have a 1 year old Alaskan Malamute sled dog who is a very strong chewer. He chews through toys and bones with no problem. I purchased the Nylabone because he can't chew it as easily as other bones plus the nibs on the ends help to keep his teeth & gums clean. The only draw-back is he likes to play tug with the bone and his pull is so strong that if I don't wear gloves the nibs on the bone cut my fingers & hand. But if you don't have a 90 lb. super strong dog that might not happen to you. I recommend this bone for strong chewers. I have a 98 lb / 2 yr old American Staffordshire Terrior mix. Bo loves this toy, however he is such a strong chewer that he has been able to bite off sections of the red handle. I have to watch him very closely when he is playing with this toy. Purchased this because my pup enjoyed my neighbor's dog toys so much! I was surprised when it arrived, It is more of a hard plastic. I realized this must be what is meant by "DuraChew." My pup will chew on it for a short time, but not as long as she chews on her buddy's Nylabone toy! It does serve it's purpose, however, as she is still biting and when I give this to her, she uses it instead... but only for a few minutes. I think it is just too hard. 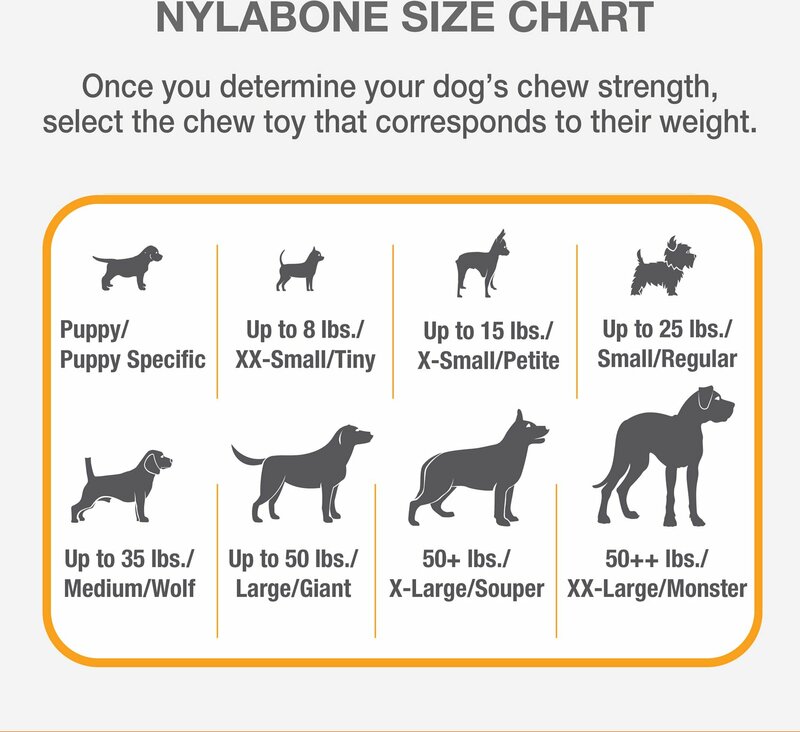 Might be more suitable for a larger breed, my little pup is only 10 lbs. So the middle red part is (as stated in the instructions) NOT for chewing. Unfortunately, my dog did not understand the instructions... and consequently this toy ended up in pieces within the hour. I think my dog swallowed most of the middle. So if your dog likes chewing, great toy. If your dogs mission is to destroy the universe with her bare teeth... I would go a different direction. This is a toy of her many toys that she goes to at least twice a day since owning for over a month! This occupies her for long periods of time, which has never happened before! It’s held up well and she enjoys all portions of it. She’s had chew toys, the Y shaped flavored toy for example that she only chews one of 3 knobs for whatever reason, but this is appealing overall - all segments are enjoyed. Emma goldendoodle approved! I have 2 pocket pitbulls and this is one of the best toys that i could have bought for them, durable for sure, normally if i get them a toy it last 5 minutes at most haha... went by the reviews and totally recommend it! !